Gold Fever Draws African Farmers From Fields International mining companies hope to establish operations soon in the Central African Republic, one of the world's poorest nations. Meanwhile, farmers are flocking to mining villages — where the poor conditions remind aid workers of refugee camps. One village had four fires in two months. 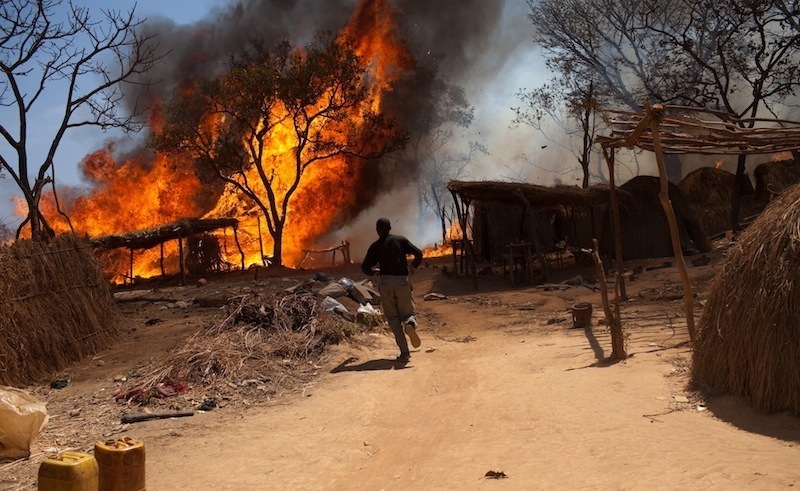 A fire breaks out in a gold mining village in the Bocaranga region of the Central African Republic in January. The possibility of a lucky strike has many farmers abandoning their fields for the mine, but aid workers express concern over poor conditions. In the middle of Africa lies a little-known country, landlocked and sparsely populated, that could well be one of the world's leading exporters of gold in the near future: the Central African Republic. International mining companies hope to establish operations there soon. But until then, with gold prices soaring, the hunt for gold is led by former farmers. In one mining village, thousands of people are gambling on a lucky strike. The Mombdi mine is located approximately 3-5 miles from Bocaranga. Levi Cumbo has been working for the past several months at a gold mine called Mombdi in the northwest corner of the Central African Republic. Miners discovered a rich vein about two years ago, and every day more families arrive — men, women and children — to dig in the deep trenches. "It's very difficult ... it's totally — it's luck," Cumbo says. "Some people will find a million in a month, then other people will find 200. That's what we are, you know. We are miners; we are proud of it." The value of gold in the regional currency, Central African CFA francs, that Cumbo claims to find here translates to anything from 50 cents to $1,000 a day. As farmers abandon their fields to search for gold, aid workers like Brook Lauten of the International Rescue Committee, a humanitarian aid organization, have become increasingly concerned about conditions at the crowded camp. Though Cumbo may tout the riches he can find, a team from the IRC sees little sign of wealth here. "There's no school, there's no latrine, there's no hospital," says Prosper Irambona, a field coordinator for the IRC. Lauten says the crowded village of grass huts looks all too much like a refugee camp. "This looks like what people would first do in a situation of displacement. So it looks like people have just arrived here," Lauten says. Approximately 100 thatched-grass homes and market kiosks were destroyed in the mining village's fourth fire in two months. Waiting for a tour of the mine, there's a sudden commotion. A wall of fire is very close and moving fast. Everyone runs. 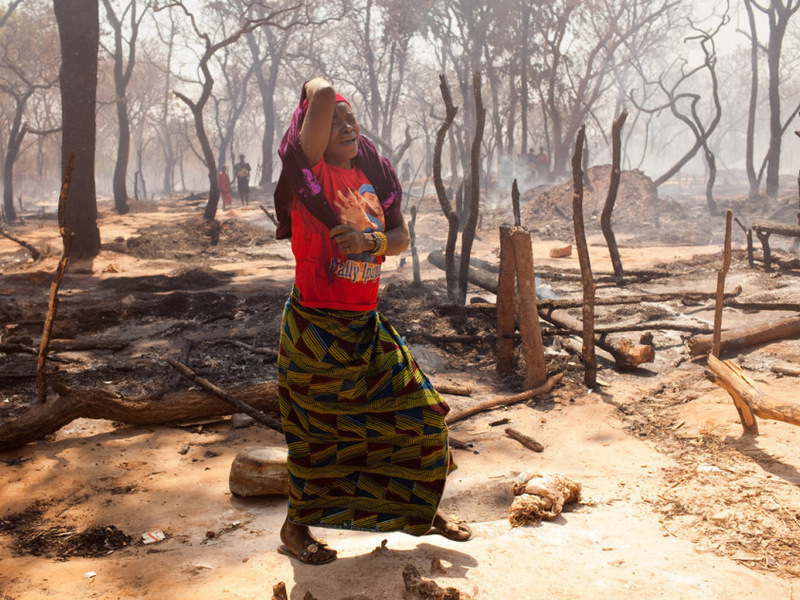 The fire burns through dozens of homes before frantic villagers are able to put down the blaze. There are no casualties, but all around people are crying — they've lost goods, food and money. Cumbo tells Lauten that these fires happen all the time — four times in two months. Fires like this have not slowed the pace of new arrivals; the camp is bigger than ever with 2,000 inhabitants. The mineral wealth of the CAR is mined entirely by communities like this one. Nobody knows how much gold makes it onto the international market from these communities, but some estimate as much as 2 tons a year, mostly sold through the black market. Sebastien Pennes, who heads Tetra Tech ARD, a U.S.-funded organization that advocates for mining reform, says the rising price of gold has infected the region with gold fever. "With a lucky strike you can make enough money to live for two or three years, but of course that lucky strike is so rare that at the end of the day you are better off working in the field. But, you know, this is ... the dream of people. If you are lucky you can be very, very, very rich," Pennes says. With a lucky strike you can make enough money to live for two or three years, but of course that lucky strike is so rare that at the end of the day you are better off working in the field. Riches are hard to even imagine in the Central African Republic — it's ranked among the 10 poorest countries in the world. Decades of chronic rebellion have meant no security and no development. But recently the government has stabilized, and a Canadian gold mining company has just signed a 25-year contract with the government. Pennes says state coffers are expected to swell. "There might be enough gold in CAR to have CAR become one of the seven biggest gold producers in the world," Pennes says. "We will see if that's true or not, but the fact remains that it's a huge country, very unpopulated; the mineral deposits are enormous and so the possibilities are huge." Those possibilities go well beyond gold. The CAR is home to diamonds and uranium, and there's talk of oil. Industrial gold mining is on track to begin in 2013, bringing with it ballooning revenues. Where that wealth ends up is an open question, but the miners at Mombdi know what they are going to do: rebuild their grass homes quickly so they can pick up their shovels and dig for gold.